The recent China Sea identification zone is a Chinese way of nationalism and to tell the US "No". We need to reflect today that China's policy toward US is revenge against the so called Unequal treaties. This is exactly as on the eve of the Boxer Rebellion, Chinese national sentiment toward the outside is fear and great innocence. Chinese are still shrouded in the cocoon of the Boxer uprising syndrome. But think of it this way, if the 5 Chinese seaports were not opened to trade with the US, despite that China’s seaports were opened by force, then China would still be trapped as a self centered backward country. Ultimately, being self-centered will defeat any progress. China's first unequal treaty with the US is called Wangxia (in Macao) Treaty. The Treaty of Wang Hiya (also Treaty of Peace, Amity, and Commerce), with tariff of duties, traditional Chinese: 望�B�l�s; pinyin: Wangxia, was a diplomatic agreement between the Qing China and the United States, signed on July 3 1844 in the Kun Iam temple, Wangxia village, Macao. Wang Xia means looking toward Xiamen as most people in Macao’s Wang Xia village came from Fujian's Xiamen. 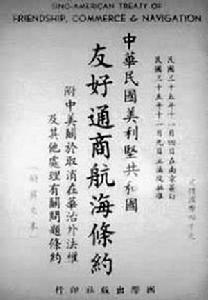 China’s first unequal treaty was the Nanjing treaty with the British. After the British signed the Nanjing Treaty on August 29, 1842, US President John Tyler, under pressure from American merchants concerned about the British dominance in Chinese trade, sent a representative to negotiate the Wang Xia treaty with China. Following passage by US Congress, the treaty was ratified by President Tyler on January 17, 1845. It is considered an unequal treaty by many sources. It allowed five seaports, Guangzhou, Fuzhou, Xiamen, Ningbo, and Shanghai to be open for trade. Both countries can set up consulates to administer their own people's affairs. My KMT Senator grandfather worked as the Xiamen Telegraph bureau chief to help China and the US with secret communications program during WWII. In 1844, the American inventor Samuel Morse sent the first message using the single-wire telegraph which he developed. 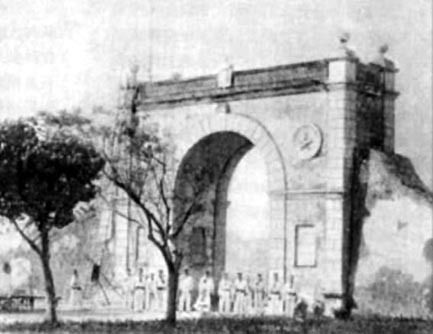 Xiamen has China's first Telegraph company because of the 1844 US China Wang Xia treaty. In 1865 the US set up an embassy in Xiamen which for communication purposes, set up China's first Telegraph Company. If US didn't force China to set up seaports for trade, China wouldn't have had a telegraph structure for US embassy to communicate from China to US. One can wrap up in cocoons to cover one's flaw of refusing to innovate, or simply see the advancement of others and pull oneself from the ignorance of world progress. The PRC has age-old hatred toward US and trains the young to call the US imperialists. They are short sighted and refuse to see it was the USA who helped during WWII to ally with Chinese Nationalists to defeat Japan. Chinese Nationalists thus recovered Taiwan which was lost during the Jiawu 1894 Treaty signed between Qing government and Japan. The PRC can’t just single out the west as the only imperialists, there were Russian and Japanese imperialists who were vying for a piece of China, Manchuria, and conducted a war on Chinese soil. Again, it was Stalin’s order to have the Communist side release Chiang Kai-Shek on Christmas day 1936 to fight against Japan. After 35 million people died, and China’s economy collapsed with 8 years of war, Mao incited people to remove the landlords whose sons were sent far away to battle and couldn’t defend local hometown in a desolate situation with Communists hiding out in the mountains near the villages. Once the Japanese left, Communists took over before the Nationalists could return back to their homeland. For our generation, it is important for the PRC not to procrastinate to tell the truth to 1.3 billion Chinese people that it was the Nationalists who gained China’s sovereignty back and that ROC still exists and is waiting to return to mainland China with executive power. Only in this way, will there be real unity among Chinese people. Thanks to the US, China was able to have Morse's telegraph, to advance new communication technology to China. The Wangxia unequal treaty was annulled in 1943 by US and China Nationalist government, and US extraterritorial rights and consular referee rights were abolished, replaced by a ROC-US friendly commerce navigation treaty. Although the US wanted to expand in the 19th century following the footsteps of the British, they did bring the telegraph to China, and helped China to fight against fascist Japan in World War II. The world geopolitical order has shifted, so that US is now the ally of Japan, however do not forget the Nationalist government abolished all of the unequal treaties as a result of their alliance with the US fighting against Japan's invasion. Communist China needs to understand the bond between the Chinese people and the US people, and the contribution toward building world peace.